Our Business Studies options enable students to observe businesses at first hand within a dynamic, exciting and rapidly changing Mediterranean environment. Students learn the relevance of their coursework, develop new ideas, experience the application of business and economic principles and practice data collection and analysis. This study day examines a variety of ways in which Barcelona is recovering its leading role as a magnet for foreign direct investment and as Spains industrial powerhouse. Visits can be made to Zona Franca, Logistics Park, Parc Tecnol�gic del Vall�s (Science Park of El Vall�s), the Autonomous University of Barcelona and the inner city 22@ district. Contrasts are made between these different industrial zones, and their importance to the Catalan and Spanish economy analysed. The day may be combined with a factory visit, e.g. the SEAT car plant at Martorell, near Barcelona. Visits to industrial providers are very popular, dependent upon availability, and often require a reservation up to a year in advance. Two of the possible visits below may be combined to make a full day. The Electronic Trading Floor of the Barcelona Stock Exchange receives over 700,000 visitors a year. The latest technology provides real time information on market movements. This visit will help GCSE students understand the nature of financial control, whereas students of Accountancy and Finance at 'A' level will develop an understanding of strategic decision-making. Coca-Cola is the world's leading manufacturer, marketer and distributor of non-alcoholic beverages. Here students can gain an insight into how the drinks are made, bottled and distributed. This visit to the Estrella Damm Brewery explores the beer making process, from the brewing to the final bottling. Only non-alcoholic beverages are provided for tasting for students under the age of 18 years. Minimum advance booking: 3 months. For many students, a visit to Pere Ventura is one of the highlights of their visit to Catalonia. They sell to 43 countries worldwide and can produce 35,000 bottles per day. Their main markets are Japan, Hong Kong, Canada, Nigeria, and Mexico. Current production is over 1 million bottles per year. There is a very clear explanation of the wine growing process and all departments are visited. The tour follows the bottles on their journey from the cellar resting period, to the removal of the sediment by freezing the neck, corking and labelling. Pere Ventura uses traditional manufacturing methods combined wiith state-of-the art automation, including robots. The visit ends with snacks and grape juice sampling. Pere Ventura staff are very welcoming and are open to all questions. Only non-alcoholic beverages are provided for tasting for students under the age of 18 years. As Catalonia's best-selling newspaper, a visit here can be related to the Business Environment. Two tours are on offer here and you can choose the most relevant to your students. Choose between an editorial visit, which will outline how the stories are put together and a printing visit, which details the production and distribution process. Minimum advance booking: 9 months, with availability suspended during commercially sensitive periods such as new model launches. SEAT was first established in 1953 with assistance of Fiat with whom it worked until 1980. It is now owned by VW/Audi/Lamborghini. Its new factory at Martorell, opened in 1993, is the most modern in Europe, with just-in-time and flexible 'to order' production. Engines are imported from Hungary, Mexico, Brazil, Germany and South Africa. The factory employs 12,700 and produces 6 models, 68% for export to 70 countries. SEAT has invested heavily in research and development, and around 1,250 staff work at the Martorell Technical Centre. This provides the brand with a unique position among all car-makers established in Spain in being the only company with the capacity to design, develop and produce its own vehicles in the country. Torres is a well-known family name and a successful local, national and international wine business. Students will gain an understanding of the ways in which production is organised with a full guided tour beginning at the visitor centre and taking in the entire production process. A guided visit to the Spa and the Vichy Catalan Bottling Plant introduces students to the history of the Spa and the process that begins with the water leaving the spring until it is bottled. The tour ends with an explanation of the geological origin of the water while tasting the Vichy products. 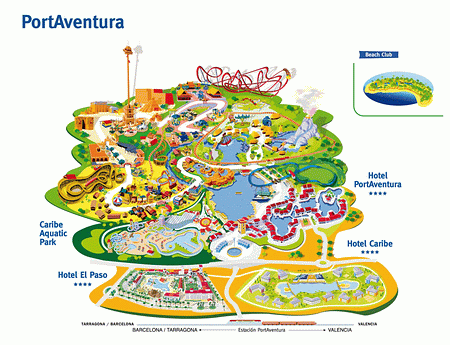 Port Aventura is located between the coastal towns of Salou and La Pineda. It consists of two parks: the Port Aventura theme park and the Caribe Aquatic Park, and three themed hotels: Hotel Port Aventura, Hotel El Paso and Hotel Caribe. The theme park features five distinctly themed areas: Mediterranea, Far West, Mexico, China and Polynesia. In total, the theme park features more than 30 attractions, 100 daily live performances, 75 restaurants and food outlets, 20 shops and 10 game areas. areas, but some also come from as far a field as Zaire and Jordan. Port Aventura offers educational workbooks in Business Studies and Tourism and Spanish Language Studies. Each workbook focuses on key areas relevant to the National Curriculum and encourages students to expand their learning in a fun and exciting environment. The workbooks are free of charge and differentiated for GCSE and AS/A2 students.